I’m passionate about painting, particularly with oil paint. What I’m not passionate about is the cleanup. So always searching for a time effective solution, let me share with you my top tips to clean oil paint brushes. At the end of a long day, the last thing anyone feels like doing is cleaning a plethora of oil clogged brushes. However, as I mature as an artist and ease into a rhythm with my painting, I’m also beginning to take pride in caring for my paint brushes and tools and enjoying developing my home studio. Tidying up and cleaning can be a very useful time to reflect on the days painting session. It’s often a common thing new artists omit from their practice. I try to keep the use of solvents to an absolute minimum but when necessary I use either Gamblin Gamsol or Jacksons Shellsol T. You can choose to use these for cleaning your brushes but I’ve found that in the long term it can take its toll on the lifespan and condition of the bristles. If you’re continuing the same painting with the same colours within a couple of days freeze your brushes!! Yep, you read right! Wrap them in cling film, tin foil or in a food bag and stick them in the freezer. The cold temperatures slow down the oxidation of the oil paint keeping them fresh for a few days. Just remember to pop them out of the freezer 10 minutes or so before you need to use them so they can come back to room temperature and be pliable again. So after a bit of trial and error here are my top tips for effective oil paint brush cleaning (solvent free). 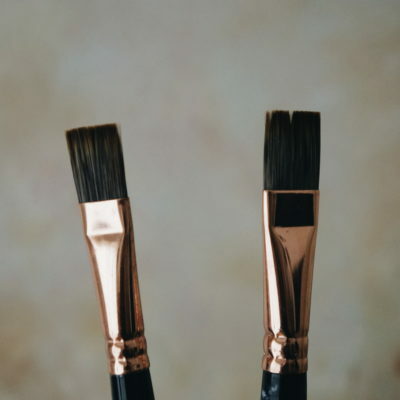 For brushes that are a bit clogged you can use a little linseed or walnut oil to begin softening the paint. I try to keep using solvents to a minimum so if the brushes have any dried paint on I use Turpenoid Natural® which is very effective. If your brushes only have wet paint on them, once you’ve wiped them you can give them a good massage with washing up liquid then rinse them with hand temperature hot water. For the final clean I use either Da Vinci Professional Brush Soap or for my most expensive brushes, I treat them to a final clean in The Masters Brush Cleaner which is an amazing product for both thoroughly cleaning paint out and conditioning your brushes. Because I find it on the pricey side I don’t use it too often, however, it’s important not to skimp on the care of your Sables and Mongoose brushes, they often cost way more than the price of a tub of Masters Brush Cleaner and it does go a long way! How do you clean your oil paint brushes? Do let me know in the comments below.